Walking Through Time is a SatNav for historical maps: A phone app that combines GPS technology with old maps to allow users to literally walk through time. 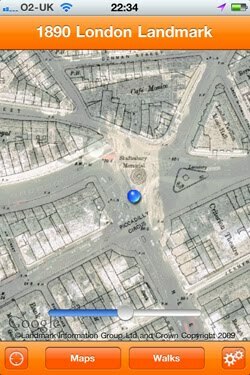 It is one of the best apps we have used and the good news is it now covers the whole of London. T he concept is great, rather than look at a Google maps you can pick London 1890 and see what London was like from your current location. Of course it could be that your in a field or a marsh and that's the beauty of the application, it brings history to life. The app has been developed by the Edinburgh College of Art to look at how smart phones are beginning to change the way that we navigate physical and social spaces. Platforms such as the Apple iPhone and Google Android that contain GPS (Global Positioning Systems) technology are becoming a powerful research platform for exploring rural and urban landscapes. At present the technology tends to provide a series of primary services; satellite navigation to allow users to travel effectively from one place to the another, or ‘locative’ services that allow users to find people or places of interest close by them. However, the systems sustain a technological and temporal determinism to show users in maps of the present as though they should feel that they are navigating a simulacrum of ‘actual’ space. The London edition is only available for a limited time so we recommend grabbing it now and walking through the streets of London as they were in 1890. The developer Dr Chris Speed is hoping to extend the project and include more maps to eventually include global coverage. If you have a historic map you would like include then do get in touch with Chris via the Walking Through Time site. You can download the free app from iTunes.